Leaving Christchurch, head north across the pancake-flat, patchwork quilt of the Canterbury Plains, for a breath of fresh country air. As you pass over the long Waimakariri River bridge, you are entering ‘Lifestyle Country.’ This broad rectangle of fertile land extends from Pegasus Bay to the golden tussock ramparts of the Puketeraki Range. Waimakariri District is a largely undiscovered playground, in which North Canterbury tourism promoters guarantee ‘Fresh experiences each day.’ This is no idle boast as the varied landscape includes high country ridges, dramatic gorges, wide braided rivers, fertile plains and rugged ocean beaches. This is a place to relax and meander at will, in a true rural environment or a mountain wilderness. For rest and recreation among the browsing sheep and dairy cattle, visit the lifestyle blocks growing olives, lilies, mead, vines, truffles and saffron. You can also experience the excitement of a juddering jet boat ride through the rocky gorge. Waimakariri means ‘River of rushing water’ in Maori and in pre-European times Ngai Tahu people from the important pa of Tuarakautahi near Woodend, followed the course of this mighty river in search of West Coast greenstone (jade). This great river, in concert with its mighty sisters, the Rakaia and Rangitata, have spread countless layers of outwash gravels from the Southern Alps during successive glaciations, to form the Canterbury Plains. Their floodplains merged to link the old volcanic island of Banks Peninsula to the mainland and form the largest area of flat land in New Zealand. Vast sheep runs were established here in the 1840’s and a number of surveyors, recognising the fertility of the land, set up farms along the Waimakariri. Local museums in the many small towns across the plains, give a fascinating portrayal of early colonial life. Today the rural scene is one of peace and prosperity, with visitors; sampling new seasons wines at vineyards, enjoying local hospitality in farm stays, B&B’s, cafes and restaurants, admiring formal gardens. Also exploring the backcountry on horseback, mountain bike or on foot, surfcasting, or trout and salmon angling, touring art and craft shops or thrill-seeking by jet boat. 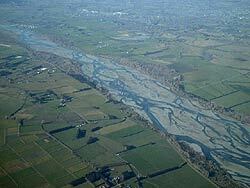 The geographic variety and the pleasant climate make Waimakariri District ideal for outdoor activities. There’s so much to see and do in ‘Lifestyle Country.’ So take in the pure country air and remember the adage ‘Fresh experiences each day.’ They await you just over the Waimakariri Bridge.